Indian Wells Players Course Hole 3: A fairly short, straight and easy par four, this one is one of the few breather par fours on the entire course, with birdie a real possibility for decently struck shots and a nice putt. Indian Wells Players Course Hole 5: The first unique hole on the course is a slight dogleg right around a desert hazard. There is also hazard and water over the mounding left of the fairway too. 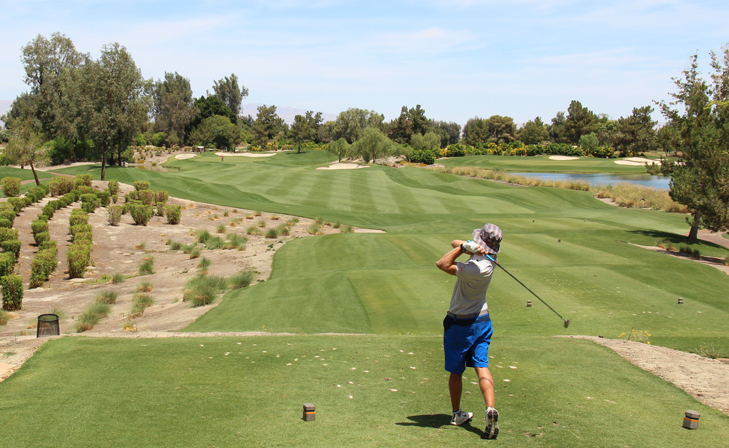 A good drive must be struck to leave a shorter approach to the green where the desert pinches in a little from the right..
Indian Wells Players Course Hole 6: This is a pretty dogleg left par four around a lake. The drive can carry the water if hit well, but the farther left it goes, the more dangerous it is. The player can leave a longer approach by hitting it right, but there is a bunker and a Native American burial ground (free drop from the latter) too far right. Indian Wells Players Course Hole 8: One of three similar feeling par threes on this course, this one is a little tougher than numbers 2 and 12 with a much larger bunker right and a steep slope back-left..
Indian Wells Players Course Hole 9: From the two back sets of tees this true three shot par five has a daunting tee shot over a desert area. From there the second can stay short of the water or stay right of it for a closer look. The green is over the water with bunkers right and long and more water left. 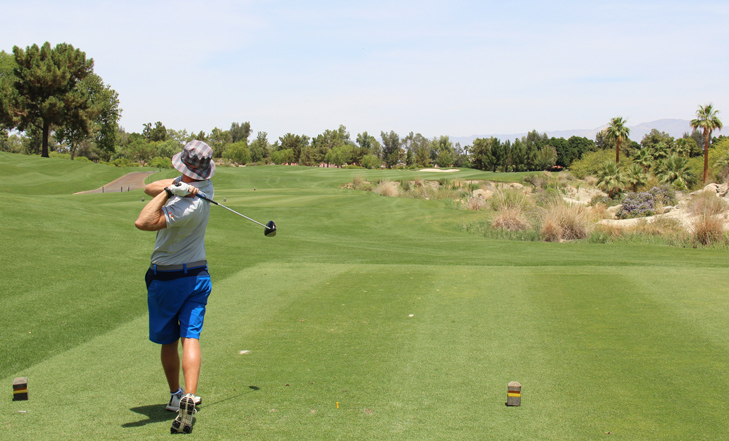 Indian Wells Players Course Hole 11: Short, but with water to the right on the tee shot and left for a longer tee shot, this par four can provide a scoring opportunity for decent shots. There is a lake just left of the green though. 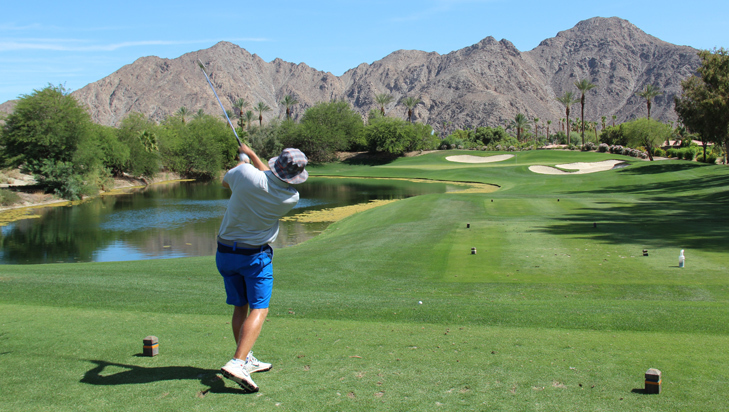 Indian Wells Players Course Hole 17: After a long stretch of tough but not particularly memorable golf holes, the course begins its journey to wrap around the hotel for the finish. This little par three is a classic one over water, with a wide, tiered green and bunkers a plenty to avoid. 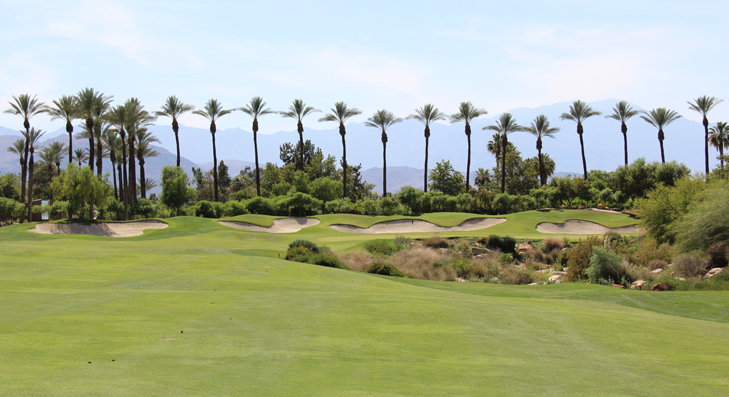 Indian Wells Players Course Hole 18: The final hole is a straight but tough par four. There is OB on both sides and the hotel pool guests could always be watching from the the right. 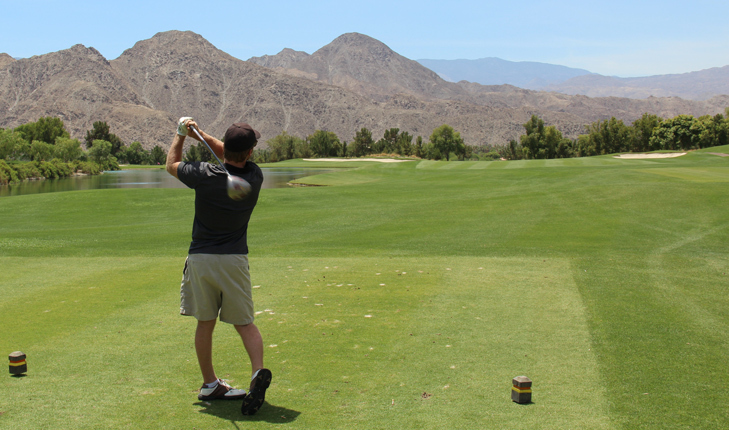 A long drive is needed to leave a decent shot of hitting the palm tree framed green, which is wide, but shallow and set over desert with steep hills and bunkering behind. The only safe miss is short-left or it is almost impossible up and down.